We've partnered with the Nation's Leading Long-Term Care Insurance Specialists LTCR. LTCR serves millions of members from over 650 alumni and professional associations. The buying power of your organization was leveraged to give you better pricing that is not available to the general public. We continually monitor benefit and rate information on the top (25+) carriers in the LTC market. LTCR then selects the best in class from these carriers for our program portfolios which allows us options for finding members the best value to benefit ratio. In addition to multiple carriers, the program provides a variety of LTC products. Whether you prefer 80/20 plans, indemnity plans, or reimbursement, a variety of products allow us to design plans that fit different needs and budgets. The buying power of your organization was leveraged to give you better pricing that is not available to the general public..
Buying coverage through your group program provides the added comfort of having an advocate for the life of the policy. Since 1997, LTCR has been providing services to millions of members of our partnering alumni and professional associations. Over 650 of these highly respected organizations trust in LTCR to provide the highest level of integrity, knowledge and our personal touch. We hope you will too. On behalf of our team of over 300 LTC specialists across the U.S., we look forward to serving you. In fact, Americans over the age of 65 years have a 70% chance of needing some form of long term care in their lifetime. Medicare & Medicaid aren’t the whole story. Medicare only covers a portion of skilled nursing costs up to 100 days. Medicaid only applies to individuals who qualify based on their income / asset levels. Long-term care costs add up fast. It’s estimated that an unexpected long-term care event may cause clients to burn through their retirement assets 2 to 3 times faster than expected. Caregiving involves lifting, bathing and toileting which can take an emotional and physical toll. It’s no wonder a spouse caring for their disabled spouse is 6 times more likely to suffer from anxiety or depression. The average annual cost of a private room in a nursing home in 2015 was $91,250. Without Long-Term Care insurance you have decided to pay for your own long term care expenses. Approximately 70% of people over the age 65 will require some form of long-term care services during their lifetime, and more than 40% will require this care in a nursing home. Still considering life without long-term care insurance? Not purchasing Long-Term Care Insurance will save you some money. You may save $200-$300 per month (based on the cost of an average LTC plan). If you don’t need care, this money can accumulate for your heirs or you can spend it how you choose. You will need to depend on your own resources to arrange for care. A spouse, adult children or a friend will need to contact government agencies or use the “Yellow Pages” to coordinate and find the quality of care you desire. If the need for care lasts for an extended period of time, your life savings could be depleted leaving your spouse impoverished or with nothing to leave to your heirs or favorite charity. If your life savings is spent caring for one spouse, the surviving spouse would need to depend on Medicaid or Welfare for their potential care needs and living expenses. Is a Long-Term Care Insurance Policy the Answer? The conventional wisdom has been that if you have limited income and resources (defined by many experts as having assets, including your home, that total $50,000 or less) you can forgo this insurance. The government — i.e., Medicaid — will pay for your care which is limited to select facilities that accept Medicaid. But if your assets are not limited to $50,000, Long-Term Care Insurance is most likely your best option. Long-Term Care Insurance will preserve your assets for your heirs, spare them the physical, emotional and financial burdens of caring for you. Long-Term Care Insurance will allow your family to oversee your care rather than make life sacrifices to provide it. You can’t out invest insurance. Are you familiar with RMD’s? Are you Self Insuring or Self Funding? 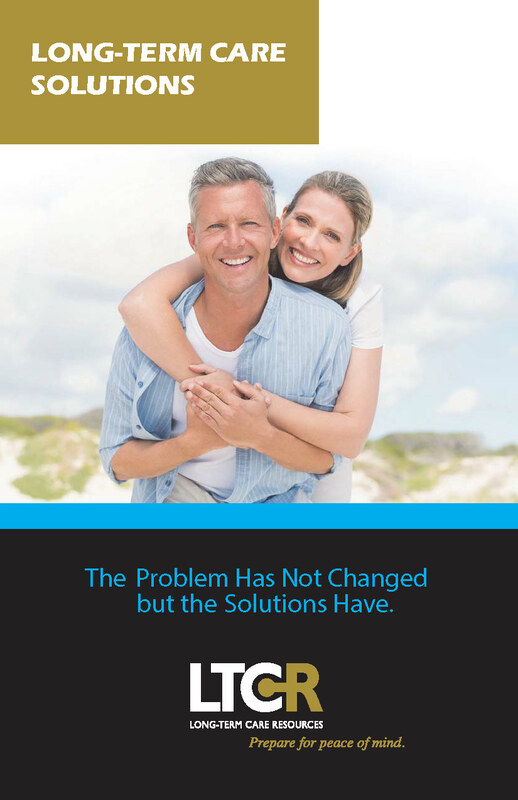 Click the image below to download the Long-Term Care Solutions Kit. Long-Term Care Resources (LTCR) is a national insurance agency and marketing company dedicated to Long-Term Care Insurance and the senior market. LTCR represents the top LTC insurance companies in the industry. LTCR is one of the leading independent LTC distributors in the country. LTCR specializes in marketing LTC insurance through partnering with organizations such as professional associations, alumni groups, and small businesses. LTCR is the endorsed LTC provider for over 650 affinity organizations. Founded in 1997, LTCR has helped nearly 600,000 affinity members with their long-term care planning needs. Through LTCR’s marketing programs and our national network of LTC Specialists, clients are able to compare multiple LTC plans from the top carriers in the market. In addition, our clients are able to obtain certain plans at discounted rates not available to the general public. Since 1997, LTCR has been providing service for life to millions of members of our partnering alumni and professional associations. Over 600 of these highly respected organizations trust in LTCR to provide the highest level of integrity, knowledge and our personal touch. We hope you will too. On behalf of our team of specialists across the U.S., we look forward to serving you. Privacy Statement: LTCR is committed to making every reasonable effort to protect the privacy of anyone that visits our web site. LTCR will not collect personally identifying information about you when you visit our site unless you voluntarily and explicitly choose to provide such information to us. Providing such information is strictly voluntary. If you have any questions about this privacy statement, the practices of this site, or your dealings with LTCR, please contact us Toll Free at 800-616-8759.